2010 Chevy Avalanche Z71 4WD Loaded with leather , dual power heated seats, Bose CD Sound System , running boards , clean carfax, brand new tires , alloy wheels, keyless entry, remote start, ice cold air, very clean, like new, priced at 14995.00 . Come take a test drive today. 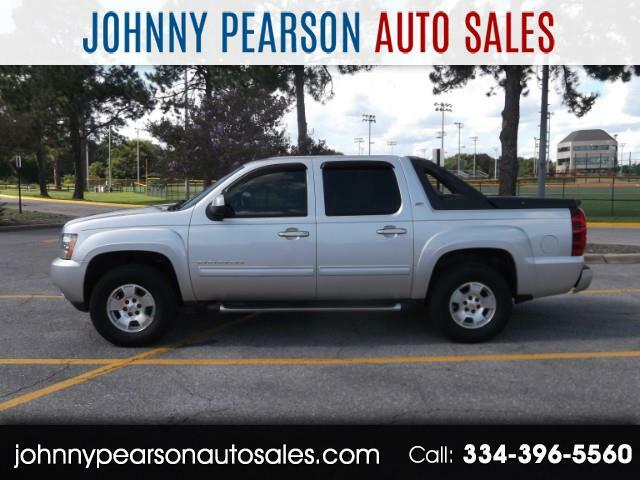 Located at Johnny Pearson Auto Sales 556 North Eastern Blvd Montgomery AL 36117 Financing Available Call 334-354-0123 Sheer Silver Metallic 6-Speed Automatic, 4WD, 4-Wheel Disc Brakes, 6-Way Power Driver Seat Adjuster, 7 Speakers, ABS brakes, Adjustable pedals, AM/FM radio: XM, AM/FM Stereo w/CD Player, Automatic temperature control, Bodyside moldings, Bose Audio System Feature, Brake assist, Compass, Delay-off headlights, Driver door bin, Driver Manual Lumbar Control, Driver vanity mirror, Dual front impact airbags, Dual front side impact airbags, Dual-Zone Automatic Climate Control, Electronic Stability Control, Emergency communication system, Floor Console, Front anti-roll bar, Front Bucket Seats, Front Center Armrest, Front dual zone A/C, Front fog lights, Front Halogen Fog Lamps, Front High-Back Reclining Bucket Seats, Front Passenger Seat Adjusters, Front reading lights, Front wheel independent suspension, Fully automatic headlights, Heated door mirrors, Heavy-Duty Rear Locking Differential, Low tire pressure warning, Occupant sensing airbag, Outside temperature display, Overhead airbag, Overhead console, Panic alarm, Passenger door bin, Passenger vanity mirror, Power door mirrors, Power driver seat, Power passenger seat, Power steering, Power windows, Power-Adjustable Pedals For Accelerator & Brake, Preferred Equipment Group 1LT, Premium Smooth Ride Suspension Package, Rear reading lights, Rear seat center armrest, Rear step bumper, Rear window defroster, Remote Vehicle Starter System, Security system, Speed control, Split folding rear seat, Steering wheel mounted audio controls, Tilt steering wheel, Traction control, Trip computer, Ultrasonic Rear Parking Assist, USB Port, Variably intermittent wipers. If you regularly pull a boat or trailer and also need the cargo capabilities of a pickup truck, along with abundant passenger space and comfort, remember that a properly-equipped Avalanche can tow up to 8,?100 pounds. With its versatile Midgate configuration, the 2010 Avalanche can be set up to carry long loads (including four-by-eight-foot plywood sheets) or, with rear seat backs raised, to hold a full complement of passengers. Features and options are descriptive of what can be expected on the vehicle. Actual options should be verified by the customer and dealer. Price may exclude taxes, license, title, registration and processing fees. Please contact the dealer to confirm price and vehicle availability. Current mileage may vary due to test drives and vehicle relocation. The value of used vehicles varies with mileage, usage and condition and should be used as an estimate. Other information that may affect the value may not have been reported to CARFAX or AutoCheck. Vehicle descriptions and details on this page may have been provided, in part or entirely, by the seller or its agent.